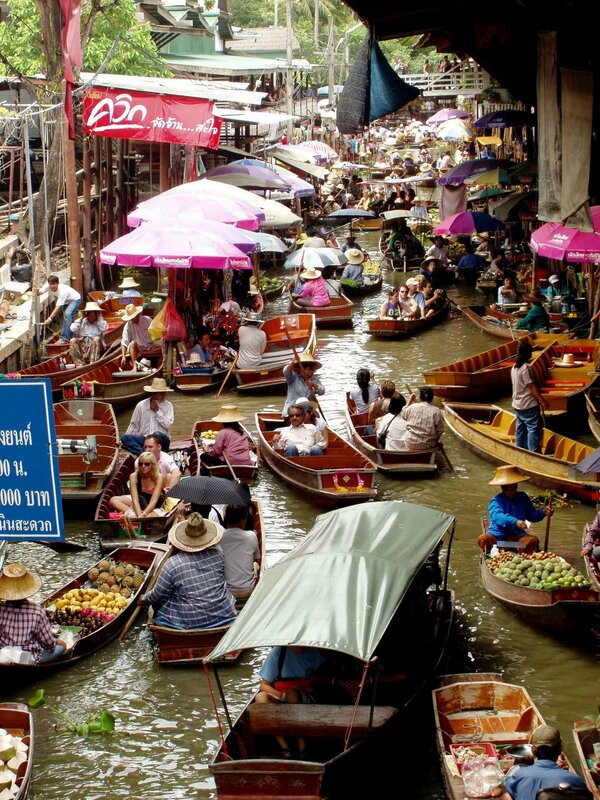 Aptly called "Venice of the East", the Thai capital of Bangkok and its myriad waterways are a way of life for tens of thousands of people and a community in many ways self-sufficient. The Chao Phraya river and its klongs are the real highways of Bangkok and provide visitors with the wonderful contrast of glistening gold spires and the multi-tiered roofs of Buddhist temples and royal palace and lines of simple timber floating houses. The way to view both is from the timber-planked seats of a hong Yao (noisy, long-tailed speedboats) which constantly weave their way through the rows of houses anchored by chains fastened to huge poles driven into the waterbed. Boats of all shapes and sizes are the universal means of transport, communicating and trade with the predominant vessel flimsy-looking but sturdy canoes of the klong peddlers who trade within the water community. The small skiffs are deftly maneuvered with a single paddle, usually handled by one woman whose face is barely seen beneath a broad-brimmed hat of palm leaves, but whose strident voice can be heard bargaining with customers seeking her vegetables, fruit, firewood and other produce. Every now and again travellers through the klongs pass by a stilted wooden house whose front veranda is a clutter of cooking utensils, groceries, flowers and some mod. con. electrical goods, like hair dryers and torches. Despite these advances the people of the klongs are not yet up to washing machines and the like. The women of the community are generally seen doing the family washing in the water passing down the klongs to the main river. But the klongs have even greater uses for their inhabitants. The cackle of children's laughter is never far away as the naked brown bodies of the youngsters plunge in and out of the water delighting each other as they splash the passing tourists. Even a friendly splashing is preferable to the raucous, ear­splitting crescendo in the capital's streets. For while the speedboats with their tiny engine at the end of a long pole to allow them to travel through shallow water also make a terrible racket the noise is not so intrusive in the rural atmosphere as in the streets lined with glass and concrete. What's more the rules of navigation in the klongs are paid much more attention than the heed paid by drivers to the rules of the road. It is customary, moving through the klongs during the high water season to see that many of the houses have hung a red flag - or sometimes a scrap of red paper - in a prominent place to persuade water craft to pass slowly to avoid washing water into the lower quarters of the house. In this water-dominated community older traditional houses now rub shoulders with some of more modern design, not necessarily so pleasing to the eye, but evidence that some Thais are re­discovering the pleasures of life on the klongs. The hong yao which leave the wharf near the Royal Orchid Sheraton Hotel take tourists on a journey of a couple of hours which culminates in a slow cruise back to the wharf on a converted rice barge. The entire tour costs about $25 and is a genuine bargain for an insight into the water peoples' culture.